“I’ll stir. You chop,” Susan said. She loves stirring because it’s so relaxing and sensed that in my wired state, I needed some chopping to keep my hands busy. Reyna had persevered with my jumping around like a five year old in the local mercado, asking a million questions, while she meticulously examined each item to be purchased, at it’s freshest best, for our class this morning. 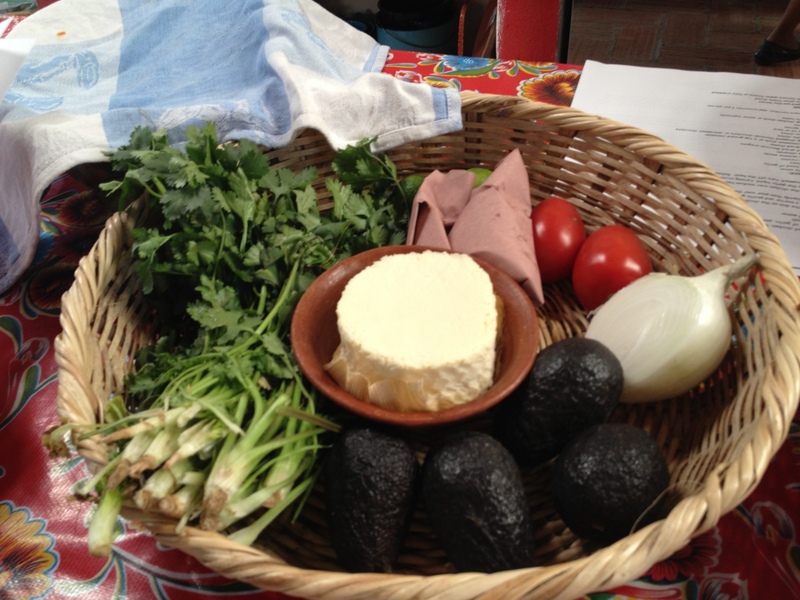 The shopping ingredients included what we needed to prepare mole rojo. 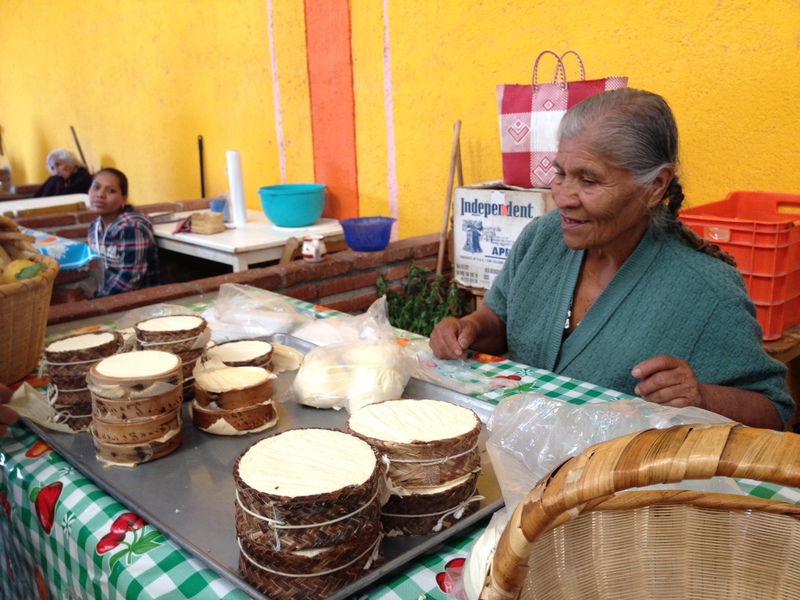 The recipe belongs to Reyna’s family and has passed down through generations. Mole Rojo or Red Mole is used for wedding luncheons and smaller fiestas, just right for an intimate dinner with good friends. 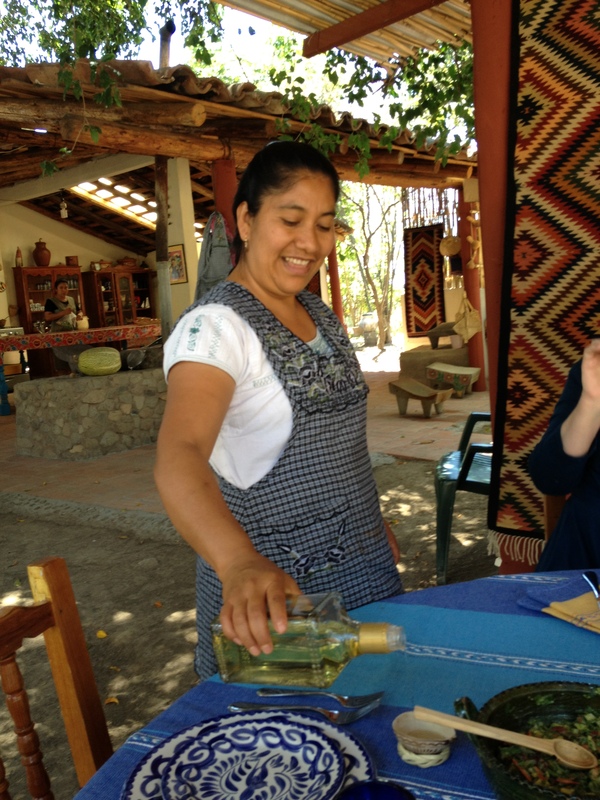 Susan (photo left) and I both jumped at the chance to take a Oaxaca cooking class given by Reyna Mendoza Ruiz, a Zapotec woman expert in her craft. 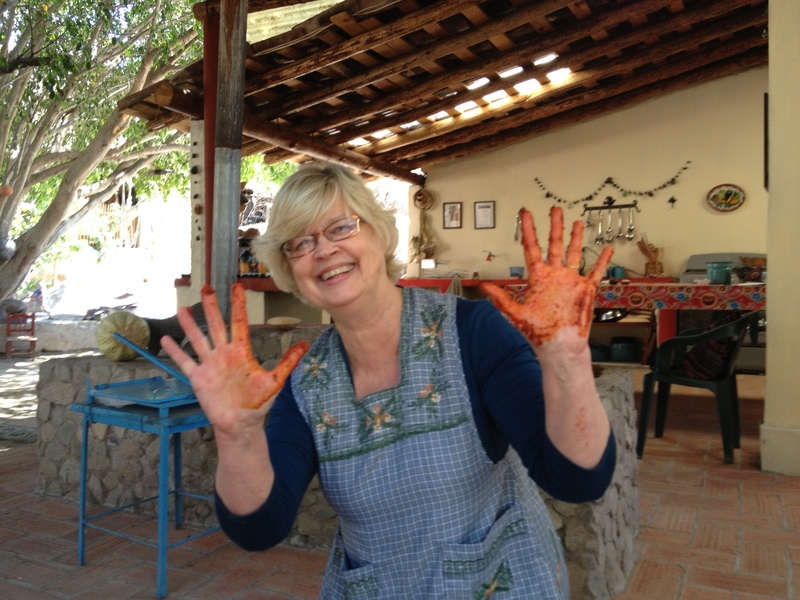 I met Susan at the Lifting Your Creative Voice: Women’s Creative Writing and Yoga Workshop in Teotitlan de Valle. We became instant friends when we discovered a shared love of cooking, entertaining and, of course, eating. The thought of dazzling my friends with a real scratch mole would not be suppressed, but the ingredients list had always scared me away. The fire crackled under the comal, which is a ceramic plate like a pizza pan, while a warm smoky aroma swirled in the outdoor kitchen as we worked. Perfect in her efficiency, Reyna taught us to roast chiles, onion, garlic, almonds, sesame seeds, cinnamon and herbs just enough to release their flavours. She brushed the roasted ingredients one by one into a large bowl with a handmade whisk. Susan and I had trouble with this simple task. It was foreign to us. The fire died exactly as the roasting finished. Reyna ground garlic and salt in a mortar and pestle to coat the chicken before simmering. Now that the roasted ingredients had cooled we went to the metate. This metate was a wedding gift to Reyna’s grandmother. It is a downward sloping concrete square about the size of a patio stone. It curls up slightly at the bottom forming a shallow dish shape. A stone rolling-pin, called a mano de metate and as smooth as marble from years of use, rolls over the ingredients making a paste. 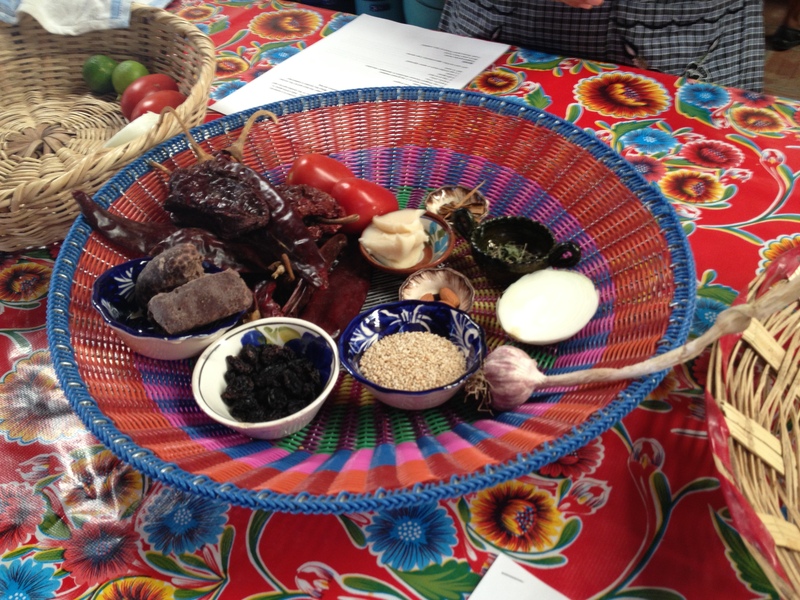 As Reyna worked grinding the ingredients and adding a little water, we began to notice the smell of the chiles, garlic and other ingredients as they took on a new life. Reyna made Susan and I both do a little grinding on the metate to get the feel of it. I had sore arms the next couple of days, after only about five minutes of grinding with the rolling-pin. 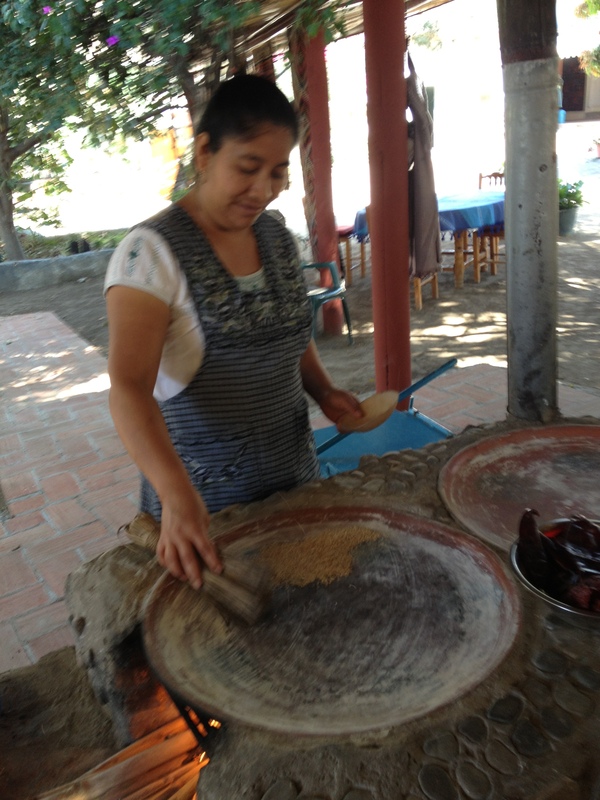 Reyna showed no sign of fatigue and shared with us that young women begin working on the metate at age ten. Normally, she would grind five times this much for her family. Her calm beauty, loving smile and smooth brown skin disguise the strength beneath. With the mole paste ready for cooking, Reyna scraped it into a handmade, clay pot and added some boiling water. The mole would simmer for twenty minutes or so before adding the chocolate, made from scratch by Reyna’s mother the previous day. 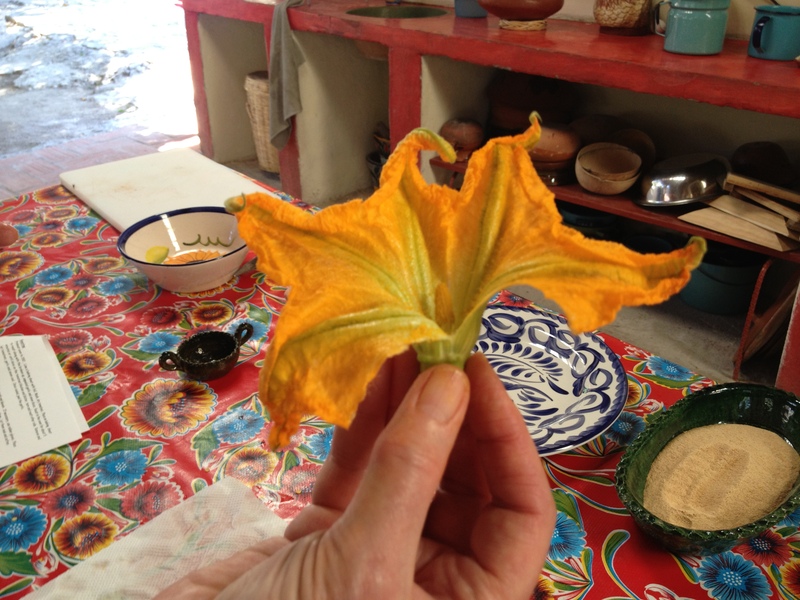 With mole bubbling and Susan happily stirring, we began to prepare the stuffed pumpkin or squash flowers. This was like winning the lottery for me, all my favorites in one menu and the same cooking class. What luck! Once the flowers are stuffed with fresh, salty, Oaxaca cheese called quesillo, breaded and pan-fried to a yellow brown, we finished the Pico de Gallo. 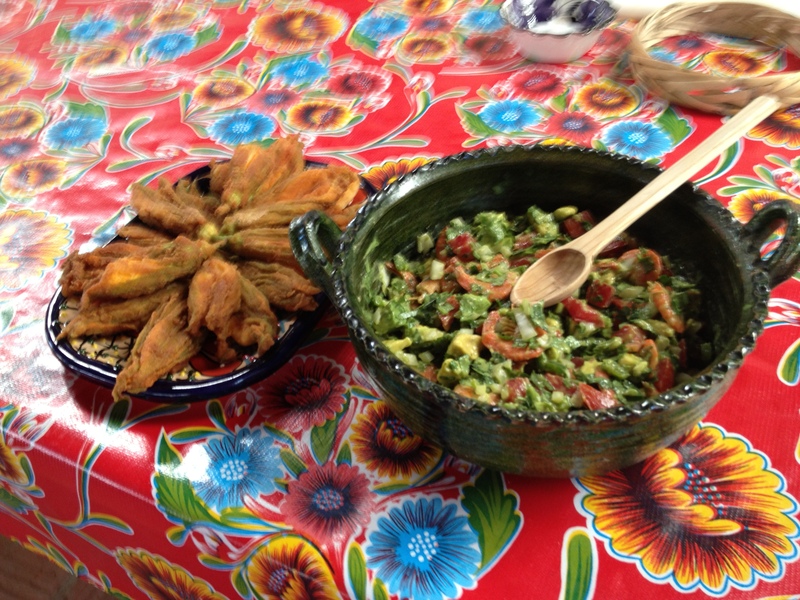 This is a cross between a tomato salsa and a guacamole, with Reyna’s special twist. 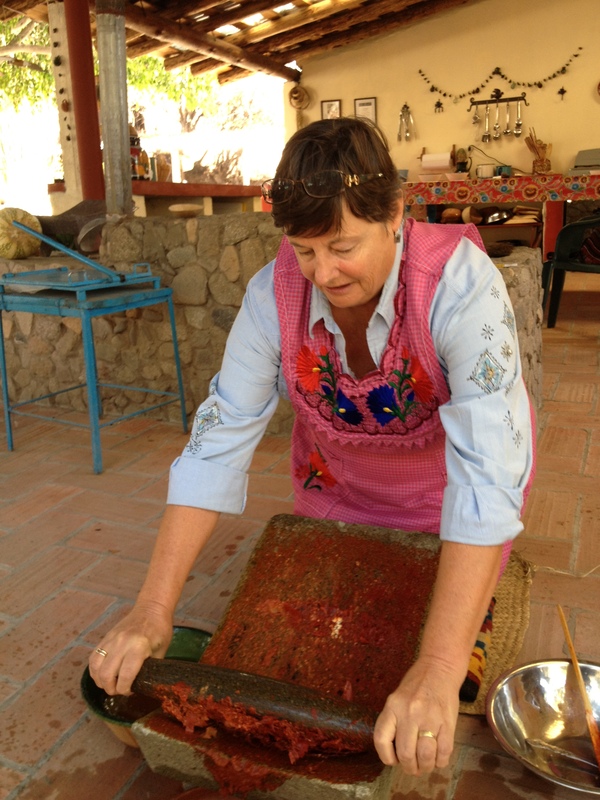 She buys smallish salt cured shrimp in the Mercado and freshens them in water before roasting them on the comal until the skins are slightly browned. Just before serving, she squeezes a lemon over the shrimp and stirs them in into the mix. The flavour dances on your tongue and races around in your mouth. Mmmmmmm. With the chicken cooked, we moved to the round table adjacent to the kitchen, which had been set with blue and white, hand-made, hand-painted pottery on a woven table cloth of blue, orange and yellow, a tapestry of colour and aroma. Reyna’s family watched and giggled from their outdoor living room as we sat down, and a young boy who had been lurking shyly on the fringe of the kitchen all morning came a little closer. Javier, he introduced himself. They wanted us to be pleased with our meal. 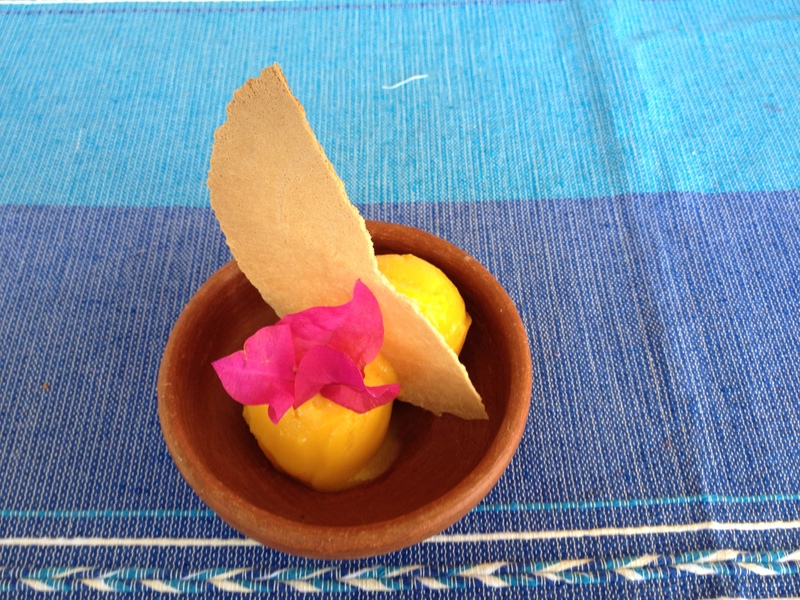 Reyna poured us a shot of mescal in a small dried gourd, which had carved plants and animals around the upper edge. It fit perfectly between my thumb and forefinger. The mescal had a smoky, slightly sweet taste. She arranged the chicken and mole on the plate and we helped ourselves to fresh tortillas and the pico de gallo. Delicious doesn’t even begin to describe either the food or the experience. If you even get a chance to do this, don’t pass it up! 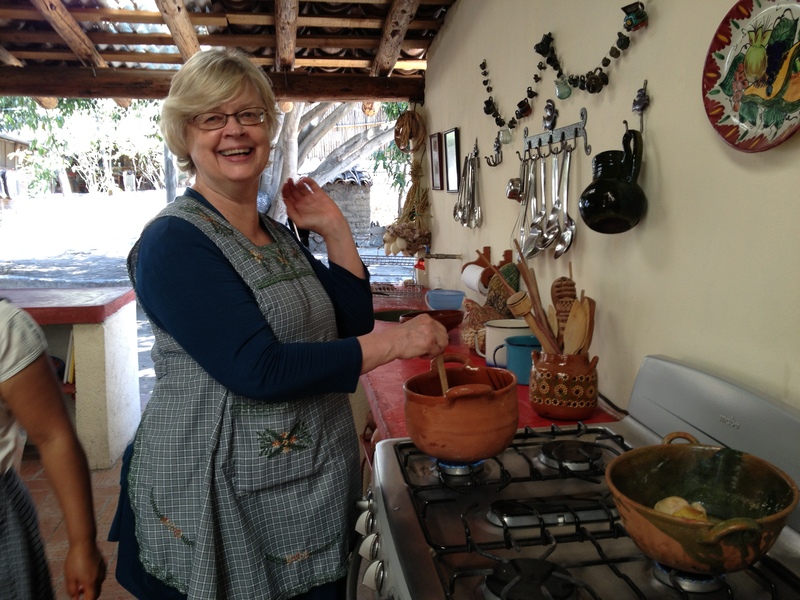 *I invited LeeAnn, a participant in our Women’s Creative Writing and Yoga Retreat, to write about her cooking class experience. LeeAnn was born in Toronto, Canada, and graduated from St. Lawrence College in Kingston, Ontario. She now lives half the year in Puerto Escondido, Oaxaca, Mexico and the other half on Quadra Island, British Columbia, with her husband Mike. They are retired salmon fishermen who love to sail, play golf, and stay warm! LeeAnn took all the photos, except for the one of her at the metate, which Susan shot. This entry was posted in Oaxaca Mexico art and culture and tagged class, cooking, El Sabor Zapoteco, food, Mexico, Oaxaca, Reyna Mendoza Ruiz. Bookmark the permalink. Loved it. Immediate, real and tasty! Good title! Thanks, Marta! Makes me want to take another cooking class with Reyna!